Question 5: In 2017, the Santa Fe Watershed Association celebrated its 15th anniversary for the Adopt-the-River program. What are your reflections on this stewardship activity to help take care of the Santa Fe River? Stewardship is critical and reflects what I believe is a correct and good perspective on how we care for the environment and this great place that we live. The City should continue to support this program and participate in stewardship of the Santa Fe River. In my job at The Trust for Public Land, I helped to create the Railyard Stewards, now the Railyard Park Conservancy. It is necessary to ensure stewardship of our commons by our community. As someone who has lived in Santa Fe all my life, I have seen how this program has helped to transform areas along the Santa Fe River from places you try to avoid to ones where you want to spend time. The people involved in this program deserve the thanks of all the people of Santa Fe. I congratulate the Santa Fe Watershed Association (SFWA) for 20 years of stewardship of our watershed and 15 years managing our Adopt-the-River Program, in partnership with the City and County of Santa Fe. 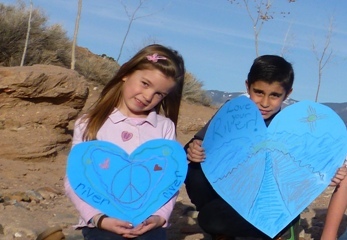 Enlisting businesses, groups, and individuals as river stewards, through a financial sponsorship by river sponsors, to care for a section of the Santa Fe River is a great program that has achieved much success in keeping our river free of trash and vibrant with native vegetation. Contributions, which can be in the form of a payment plan, are tax-deductible. This program ties into the SFWA and SF River Commission’s efforts to maintain bypass flows to the Santa Fe River to continue meeting their objectives of a vibrant, riparian river area. We must continue supporting this program for generations to come. Congratulations! You have a lot to be proud of. The Adopt-the-River program is valuable because it does much more than the critical work of helping to clean up the river. It stimulates community involvement and ownership from both parents and kids. Increasing awareness of all the issues surrounding the river is one of the best ways we can guarantee long term support for a healthy river corridor and a clean environment. Involved and committed community members being proud of their river— which is really a very long thin green park through our city— is something we should always work for. SFWA’s work to establish an Adopt-an-Arroyo program is a logical step to educate and involve people in the many parts of our City that are impacted by arroyos, and could help slow down stormwater runoff and recharge our aquifer. I support both of these programs.